God’s Word allows us to see God at work throughout history…and that allows us to get to know Him in a greater way. Through reading His Word regularly we learn who God is, how God thinks and how He wants us to live. Resting at the River’s Edge provides a schedule that enables you to read through the entire Bible over a two-year period. During those two years we read through the New Testament twice and the Old Testament once. 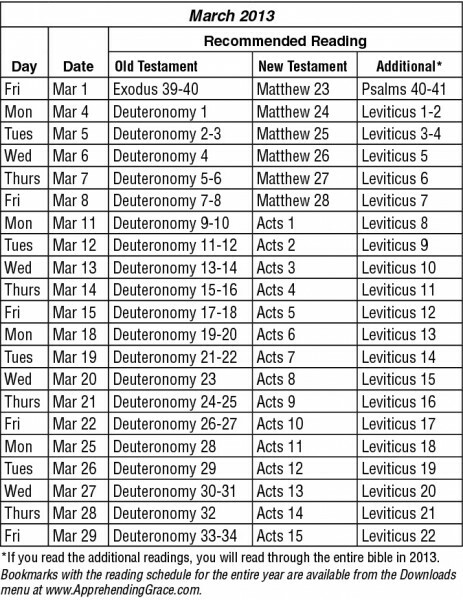 Our schedule includes “Additional Readings.” If you read through both the scheduled and additional readings, you will read through the entire Bible in 2013. Join us! 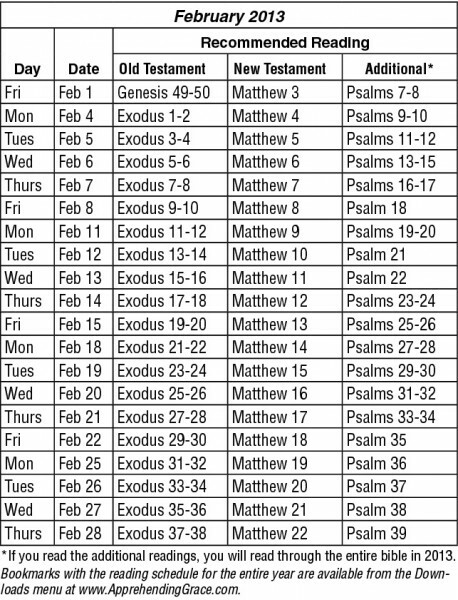 Let’s read through the Bible together this year. God will speak to you personally as you read. Since God usually speaks to me as I am reading His Word, you’ll find that many of the blogs I write relate directly to the Resting at the River’s Edge readings for that week. Join us as we read, then e-mail me, leave a message on my Facebook page, or post a comment at the end of any blog. Tell me about the treasures you’re finding in His Word. I look forward to hearing from you. 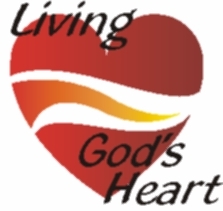 Reading God’s Word opens His heart to us, giving us the opportunity to learn how He thinks and see how He loves. It also opens our spirit to His spirit, giving us the opportunity to breath in His peace. God’s Word carries His power and presence. It is living and breathing, and it gives us life. There’s some motivation to spend time in it each day. You’ll find our February reading schedule in the January/February bookmark and in the table below. Click on one of the following buttons to open a PDF file of the January-February bookmark or all bookmarks. After the file has opened, you can print it or save it to your hard drive from your browser’s file menu. Click here for the January-February 2013 recommended reading bookmark. Click here to download all bookmarks for 2013. Don’t forget to share what God is teaching you. E-mail me, leave a message on my Facebook page, or post a comment at the end of any blog. The recommended reading schedule for February is below. What’s your Sunday morning routine like? For most people it’s rush, rush, rush to get out of the house and make it to church on time. Then there’s likely an argument in the car on the way to church. Finally, there’s the rush into church (on time if they’re lucky), put all their stuff down and join the already in progress time of worship. Ouch! Even if your Sunday morning experience is only half as frantic as I’ve described, it’s a far cry from preparing for worship in a way that honors God. In this Old Testament passage, the Israelites were told to prepare for three days – three days! – to meet with God. I wonder how much richer my experience with God would be if I prepared for three days before meeting with Him! Well, like you, I don’t have three days to set aside each week to prepare to worship God. There are some things that we can do on Saturday and Sunday to help us prepare to meet with God. Over the years Phil and I have developed seven strategies that help us arrive at church ready to worship. We plan to arrive early. If we plan to arrive at the start of the service, the probability that we’ll either be late or frustrated increases dramatically. We’ve found that arriving early gives us time to get settled, read through the bulletin, visit with friends and be ready to worship when the service starts. So, depending on our responsibilities that Sunday, we plan to arrive anywhere from ten minutes to an hour early. We come with an anticipation of participating in worship and meeting God. That anticipation helps to keep us from becoming a spectator. If you have children, develop and reinforce this sense of anticipation about going to church with your children. Be careful about your speech – “Tomorrow we get to go to church” instead of “Tomorrow we have to go to church.” This might seem minor, but our words mean things and convey to others our real attitudes about our activities. On the drive to church, there are topics that are verboten in our car. Finances and schedules top the list. No matter now innocuous a question or comment on those subjects may seem, at best it has the potential of causing stress or discouragement in one of us. At worst it could cause a disagreement. So when we’re on our way to church and I remember that I meant to ask Phil if he had paid a specific bill or cashed a check the day before, I stop myself. It’s not that those things inherently carry stress. It’s just that we’ve learned that they are topics that quickly lead us to the cares and frustrations of this world. That’s not where we want to be on Sunday mornings. Put at the top of your list any topics that are likely to cause stress, frustration, annoyance or discouragement for anyone in the car. We try to take care of the practical things the night before. Things like learning the shirt we were going to wear is dirty or not being able to find what we need to take with us can lead to a cranky rush as we make our way toward the car. We are sensitive to what’s on the television while we’re getting ready for church. On a typical day, I have a news program on TV while getting dressed in the morning. On Sundays we often change that routine and listen to televised church services. We are careful about the time we go to bed on Saturday night. Sometimes we miss this one and when we do, we’re usually sorry. It’s hard to truly worship God and even harder to hear His voice when we’re fighting fatigue and sleepiness. We frequently pray on the way to church. (What a radical idea)! We pray for our selves, the worship team, those teaching and giving the message. We thank God for the privilege of meeting openly in this country. Sometimes we’ll sing praise songs or old hymns while we drive. It’s amazing how the attitude in the car changes when we do this. We have this awesome opportunity to spend time with the creator of the universe in corporate and private worship every Sunday morning (or whenever your church meets). Let’s make the most of it by preparing in a way that honors Him.